Panther Motors and The Rent Me Superstore of Myrtle Beach are excited to announce the delivery of their new fleet of P50’s. The Rent Me Superstore has been renting ScootCoupes since 2013 and according to General Partner Ricky Griggs they are an essential part of their overall rental business. 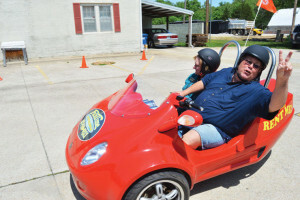 According to Ricky, ScootCoupe touring is such a popular activity for tourists visiting the Myrtle Beach area they have trouble filling the demand. We look forward to the Rent Me Superstore having a great summer season with our new Piaggio based P50 ScootCoupe’s. If you plan on visiting Myrtle Beach this summer, please stop in and take a ride. You can follow The Rentme Superstore on Facebook or Instagram, #rentmesuperstore, #scootcoupe or visit the rental locations page on www.scootcoupe.com to find their full contact information. I have seen a vehicle that crossed a plane and a car before. The maker called it more of a “roadable aircraft” than a flying car. Today, I came across the Scoot Coupe, which is basically a combination motorcycle and car, but it’s really more of a motorcycle with bucket seats. The Scoot Coupe has three wheels and handlebars like a motorcycle. However, it carries the passenger and driver side-by-side in car seats. It gets great gas mileage, much the same as a regular motorcycle. A Scoot Coupe can only go about 40 to 50 miles per hour. Also, the Scoot Coupe has already been outlawed for safety reasons in some U.S. cities, so before you go blow your paycheck or loan on a Scoot Coupe, make sure you’ll be allowed to drive it. A Scoot Coupe will run you between $5,000 and $10,000, so it’s not an ultra-cheap way to travel. But it is less expensive than a new car, and of course it gets 70 to 80 miles to the gallon. Of course, the only way the Scoot Coupe is really a realistic idea is if you like to invest in stuff just because it’s cool. Obviously, because of the speed, the Scoot Coupe can’t go on the highway. So the Scoot Coupe is neither an alternative to a car nor a replacement for a motorcycle. So, given the fact that you’ll have to spend between $5,000 and $10,000 on this thing on top of your regular transportation costs, it’s pretty pricey. At least, to me it’s pretty pricey. I am aware that some people spend that much on clothes any given day of the week. 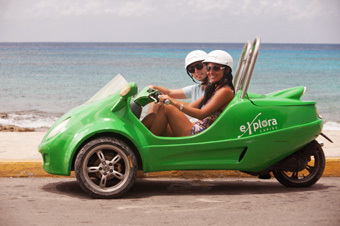 Scoot Coupes come in two models. The smaller one, which does not require you to have a motorcycle license, is the 50cc model. The larger size, 150cc, requires a motorcycle license to drive it. Right now the price listed on the official web site for the 50cc is $6,299 and the price for the 150cc is $6,599. That’s better than the “up to $10,000” that Manolith reported, but still not chump change. The company that makes Scoot Coupe, Panther Motors Inc., is based in Florida. The official Scoot Coupe web site says that dealerships all over the country are selling them. It also says you should contact the company to find the nearest Scoot Coupe dealer near you. So, here you go, contact away! 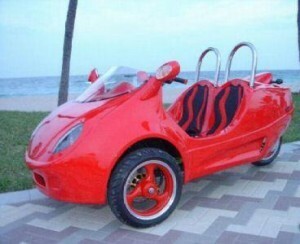 The web site is www.scootcoupe.com, the company phone number is 954-682-3693, and you can e-mail info@scootcoupe.com. 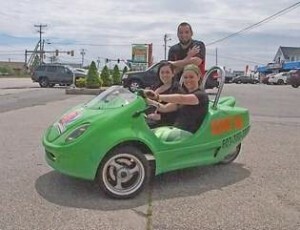 The Scoot Coupe, unfortunately, reminds me of the Puma, an experimental vehicle developed by GM and Segway. 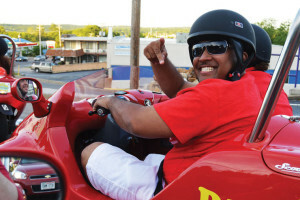 This vehicle is described as a “sit-down scooter” or a scooter-car hybrid. People are worried about safety above all else and usefulness when it comes to the Puma. Like the Scoot Coupe, the Puma doesn’t go very fast and isn’t safe for the freeway. The Puma is being pitched by GM/Segway as an electric alternative to cars. With the Scoot Coupe, it seems we have yet another vehicle that will add to transportation options but won’t serve as a replacement for traditional cars. So many companies are trying to develop vehicles that will replace cars. I don’t think that is necessarily the case with Scoot Coupe, but we’ve all seen this. I think that the key, instead of creating new vehicles, is to share the ones we have. Carpooling and more efficient, convenient public transportation are the answer to helping the environment and people’s finances. It is going to take a long time for the “a vehicle for everyone, and everyone in his vehicle” mentality to become obsolete, but I am glad to see signs that society is going that way.